When summer temperatures hot up, the root structures of cool season turf plants can suffer - with significant decline in overall root mass and the root system's efficiency to take up water and nutrients. Summer root mass decline can have serious impacts on plant health and, ultimately, playing surface quality. 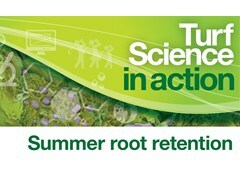 Root growth is a constantly ongoing cycle in healthy turf; new root material is created, as old root dies and degrades. The rate of decline and replacement is influenced by climatic and soil conditions. Summer root dieback occurs when a plant is still actively respiring, but its photosynthetic activity is restricted by the hotter temperatures. The plant's growth demands more carbohydrate than the leaves can physically produce, which leads to root mass reduction. Agronomy measures to minimise root loss can help to maintain better summer surface quality - and year round turf health. Roots also require appropriate conditions to grow, including adequate moisture, oxygen and temperature. Compacted soils will restrict development and can result in faster root die-back, compared to a well-aerated soil structure. Aeration, through coring or hollow-tining, for example, may cause limited superficial damage to existing roots, but can improve aerobic conditions and moisture infiltration rates to aid recovery and future growth - particularly in the spring or autumn when root growth is stronger. Providing sufficient moisture to support the root development is absolutely critical. 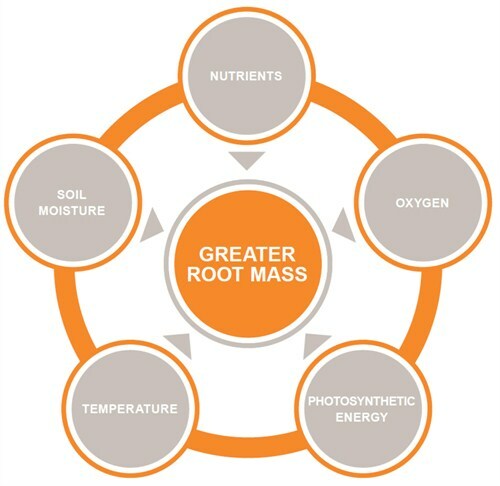 Greater root mass develops where available moisture is retained in the root zone. Using Qualibra wetting agent to hold evenly through the soil profile encourages root growth, especially in hydrophobic sands where dry patches could lead to root hair loss. In summer, water can be quickly lost from the surface, through evaporation and infiltration, which makes it so important to maintain soil moisture down through the profile. Trials have repeatedly shown that less frequent high-volume irrigation to depth is more effective for root retention than frequent light application. The technique is especially beneficial when used in conjunction with the unique combined penetrant and polymer activity of Qualibra wetting agent - which keeps surfaces firm and dry, but holds more water at depth in the root zone. It is an urban myth that roots grow 'in search of moisture'; in good conditions the root structure will grow as big as the plant's green leaf energy generation will permit. Using Qualibra to retain soil moisture enables the plant to produce and support the required root mass. Mowing height also clearly has a major impact on root mass. The more frequently and tighter the turf is cut, the less leaf there is available for photosynthetic activity, and the faster roots will be lost. Experience with Primo Maxx has shown green speed and ball roll consistency can be maintained, or even improved, at slightly raised cut heights - with significant benefits for turf health and stress relief over the summer. Furthermore, Primo Maxx can increase the concentration of available chloroplasts to enhance photosynthesis. 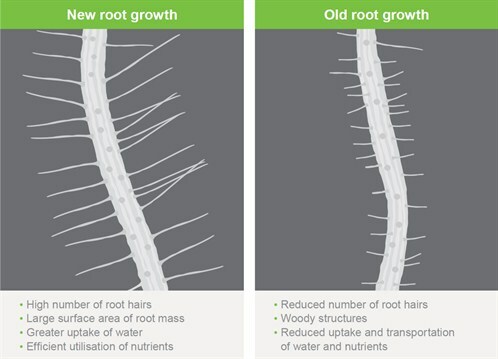 Trials have shown the energy generated in treated plants is diverted away from vertical leaf growth into lateral growth and stronger rooting - further helping to minimise the impact of summer root loss. Applying appropriate levels of nitrogen in the spring and early autumn - when root growth is at its peak - can be beneficial for root development of cool season grasses. Avoid excess N during summer that could stimulate leaf growth, at further expense of roots. Whenever a grass plant loses roots mass, such as late summer, it is a key period for Phosphate and Potassium fertiliser. Soil analysis for nutrients and pH will help develop a planned nutrition programme for turf health and root development.